Wide receivers take up more roster space and have a larger player pool to select from than any other daily fantasy position. Therefore, wide receiver is the position that requires the most decision-making from a daily fantasy owner. What makes for a good wide receiver selection? Targets should be the foundation by which wide receivers in daily fantasy are chosen. They correlate1 much more strongly with wide receiver fantasy production than efficiency metrics such as yards per reception and catch percentage. Prioritize volume over efficiency when selecting a daily fantasy wide receiver. Table 1 below shows how various statistics correlate to wide receiver fantasy points per game using FanDuel and DraftKings scoring systems. The sample includes qualified2 wide receivers from the 2013 and 2014 seasons. The first thing to do when assessing the wide receiver position every week is to see if anyone is undervalued on the basis of targets alone. You need your wide receiver to put up good yardage totals; as targets increase, yardage potential increases. You want the players you select to have the maximum opportunity possible to put up fantasy points, and receivers by nature get a lot less opportunity than quarterbacks or running backs, but they score more fantasy points on a per-target basis. The 2014 league leader in targets per game averaged only 11.5, which pales in comparison to passing attempts (41.2) or running back touches (28.1). Going back to Table 1, the importance of targets is reinforced by the moderately strong correlation between wide receiver fantasy points and market share. The primary option even in a poor offense still has a decent shot at producing good numbers in certain matchups and should never be completely ruled out. 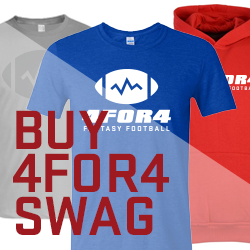 You can track wide receiver targets and target market shares in 4for4’s Target Report. Since player salaries are generally based on past production, they tend to fluctuate due to recent outliers. If a frequently targeted wide receiver has performed poorly recently, his salary may be artificially depressed. Conversely, an infrequently targeted wide receiver may have his salary artificially inflated if he is coming off recent strong performances. Both of these scenarios tend to happen often during the season because wide receivers are relatively volatile – be sure to take advantage. A wide receiver’s “upside” should be viewed as touchdown potential rather than big-play potential. Touchdowns occur more frequently than big plays -- the league averages 1.58 receiving touchdowns per game -- compared to 1.20 thirty-plus yard receptions. Furthermore, only 28 percent of those 30-plus yard receptions even go for touchdowns. I calculated the per-game statistics for all top-30 one-point-per-reception wide receivers over the last two years. Then I compared their overall average with their per-game averages in games that they scored 20 fantasy points or more, to see where the largest increases occurred. The results are in Table 2 below. By far, the greatest increase occurred in the touchdown department. Touchdown production nearly tripled, compared to more modest increases in the other categories. How do you get touchdown upside into your lineup? One way is red zone targets. Sixty-eight percent of all receiving touchdowns occur in the red zone. Red zone targets are valuable in fantasy because they greatly enhance a receiver’s scoring potential. However, red zone targets are in short supply – only 16 wide receivers averaged more than one red zone target per game in 2014. Since wide receivers on average score touchdowns on only 22 percent of their red zone targets3, those targets can increase the likelihood of touchdown production but fall far short of guaranteeing it. Combining receiver market share data with Vegas projected points or with a quarterback’s touchdown projection can further the evaluation of a receiver’s touchdown potential. 4for4’s Red Zone Tendencies report is also a great tool – it tracks what percentages of a team’s touchdowns go to wide receivers compared to other positions. To measure the consistency – or volatility – of a data set, divide its standard of deviation into its mean, giving you its coefficient of variation (CV). Below, I calculated the league-average CV for each fantasy position by taking the average CV of all qualified4 players at each position in 2013 and 2014. The shorter the bar is, the more consistent the position. Wide receivers are significantly more consistent in scoring formats that award one point per reception than they are in half-point formats. Despite being projected for the same amount of points, the two pairs have a significantly different floor and ceiling due to differences in positional consistency. Pair 2’s higher floor would be ideal for a cash game, while Pair 1’s higher ceiling would be ideal for a tournament. 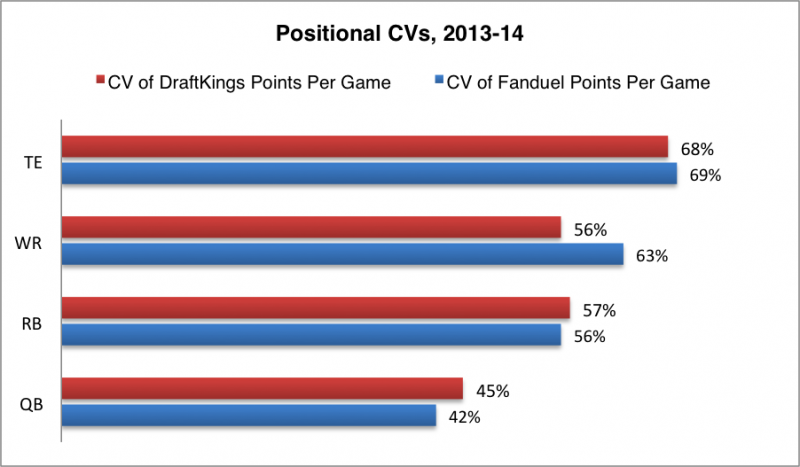 The difference between wide receiver and running back ceilings on DraftKings has been even more pronounced than the CV data would otherwise lead you to believe. 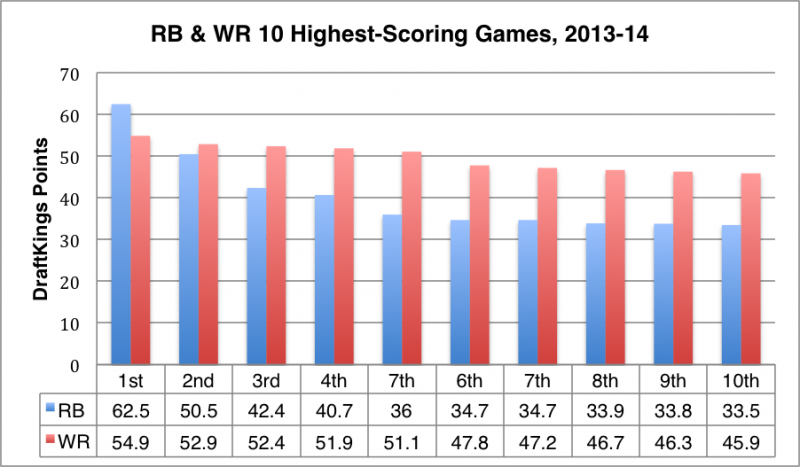 Figure 2 charts the ten highest-scoring DraftKings games at running back and wide receiver during the last two seasons. Figure 2: Who Has a Higher Ceiling; WRs or RBs? Jamaal Charles had a game for the ages when he dropped 215 yards and five touchdowns on the Raiders in 2013, but after that, the highest-scoring wide receiver games dominated the highest-scoring running back games. Overall, receivers tend to have higher ceilings than running backs. It is crucial to have exposure to that kind of high ceiling in tournament lineups. Individual CV can also be used to compare the consistency of players within the same position. For example, Antonio Brown is known as one of the most consistent wide receivers in fantasy, and his individual CV of 32 percent backs that up. Brown had only one game with less than 10 FanDuel points, compared to three for Demaryius Thomas. However, Brown also only had one game with over 30 FanDuel points, compared to three for Thomas. As Brown’s low CV indicates, he is clearly a better choice in cash games. On the other hand, Thomas’s highest scores were superior to Brown’s, which would have come in handy if you were trying to win a tournament. The caveat with using individual CV is that the sample size will inevitably be small, so don’t become overly reliant on this data. To effectively use this metric, the sample you do have must be relevant to a player’s current situation. For example, Brown’s role in the Steelers offense hasn’t changed much heading into 2015, so his CV is more relevant than say, Jeremy Maclin’s, who changed teams in the offseason. You’ve probably already seen me mention this, but CV is not meant to take the place of projected point-per-dollar values, nor is it meant to paint you in a corner in regards to how you allocate cap space. Rather, CV should be combined with projections to clarify the possible range of outcomes – or, floor and ceiling – associated with the projection. Once floor and ceiling have been calculated, divide each by the player’s salary to arrive at a projected floor and ceiling value. Shutdown cornerbacks like Richard Sherman and Darrelle Revis are capable of ruining fantasy days for opposing wide receivers. These elite corners not only make it difficult for opposing receivers to get open; sometimes their reputation alone can discourage a quarterback from even looking in a receiver’s direction. Sherman and Revis were targeted at least 24 percent less than the league average on a per-snap basis in 2014. It is important to note how a cornerback is utilized within his defensive scheme when assessing what effect he’ll have on an opposing wide receiver. Revis tends to shadow the opponent’s best wide receiver no matter where that receiver lines up. Sherman, on the other hand, usually remains stationary at his left cornerback spot, essentially shutting down the offense’s right side of the field. Therefore, a wide receiver that tends to line up on his offense’s right would be susceptible to Sherman’s coverage, whereas a team’s best receiver would be more susceptible to Revis’s coverage. When facing an opposing defense with a shutdown corner, teams tend to target the opponent’s other cornerbacks more than usual, which can cause an uptick in production for receivers who line up opposite the opponent’s non-shutdown corner. For example, on a per-snap basis, Seattle’s right cornerback Byron Maxwell was targeted 48 percent more than Sherman, and slot cornerbacks Jeremy Lane and Marcus Burley were targeted nearly three times as much as Sherman. This situation played out true to form in the Seahawks-Packers game in Week 1 of 2014: Packers wide receiver Jordy Nelson lined up opposite Maxwell, and Randall Cobb lined up in the slot, while Jarrett Boykin lined up across from Sherman. Nelson and Cobb piled up 23 targets, while Boykin was not targeted on 49 snaps. The best way for a wide receiver to neutralize a difficult cornerback matchup is to be adept at lining up at different receiver positions, especially the slot, as receivers who can line up anywhere on the field are tough to completely neutralize. Some outside wide receivers who also play a significant amount of slot snaps5 include T.Y. Hilton (40 percent of routes run in the slot in 2014), Emmanuel Sanders (37 percent), DeAndre Hopkins (30 percent), and Mike Evans (27 percent). On the other hand, Kelvin Benjamin (13 percent), Julio Jones (13 percent), and Dez Bryant (16 percent) rarely line up in the slot. When facing an opposing defense with a very good cornerback, wide receivers that move around should theoretically be safer choices than those who don’t. Many teams will suffer injuries during the season that will force them to give poor cornerbacks a significant amount of snaps. Pay special attention when the aforementioned instances arise; they can provide hidden value that fantasy points allowed statistics may not reflect. The opposing pass rush can also have a significant effect on wide receivers. A receiver who frequently runs deep routes may have trouble against a defense with a strong pass rush, as his quarterback likely won't have the necessary time to let deep routes fully develop. Conversely, a receiver who runs short routes may be the recipient of quick, blitz beating passes near the line of scrimmage. The opposite would apply in the case of a weak opposing pass rush. When analyzing matchups each week, it is helpful to put yourself in the shoes of each coordinator, attempting to decipher the most likely offensive and defensive game plans – especially their coverage scheme. Coaches watch a ton of tape of each opponent’s recent games and make tactical adjustments accordingly. To be a great daily fantasy player, you must anticipate what adjustments will be made on both sides of the ball and consider how a player's production will be impacted based on the adjustments you anticipate. The difference between the Titans' effectiveness at defending smaller wide receivers versus larger ones was night and day. Johnson and Fitzgerald didn’t light it up but both drew a voluminous nine targets, which is what you’re looking for in terms of opportunity for a daily fantasy receiver. The average size of the top 10 receivers in terms of fantasy points per game over the last two seasons was 6-foot 1-inches, 211 pounds. Weight has a moderate correlation to fantasy points per game, and height has a low-to-moderate correlation. Big wide receivers are generally more successful at converting red zone targets into touchdowns, leading to more fantasy production than their smaller counterparts. In general, bigger, more physical cornerbacks will have trouble covering smaller, quicker wide receivers, and smaller cornerbacks will have trouble covering bigger, stronger wide receivers. Recent rule changes aiming to crack down on illegal contact in the secondary need to be monitored going forward. It’s too early to definitively tell, but the changes seem to be benefiting small wide receivers the most. In 2013, the average top-10 fantasy receiver was 6-foot 2-inches, 216 pounds, but fell to 6-foot 1-inches, 206 pounds last season. The rule changes afford defenders less leeway to use physicality to knock receivers off of their route, which may allow smaller wide receivers to flourish in the long-term. Yards-after-catch (YAC) has a strong correlation to fantasy points per game and can be useful in analyzing consistency. Wide receivers who had a lot of YAC per game, such as Antonio Brown and Randall Cobb, posted sub-40 percent CVs in 2014, and were both in the top-5 in terms of consistency at the position. Wide receivers who average a high amount of YAC per game are typically getting high-percentage targets close to the line of scrimmage, making it easier for them to sustain a high catch rate – and therefore, high volume – on a weekly basis. The inherent consistency of receivers that average a high amount of YAC per game often makes them good cash game plays. To illustrate just how useful a high-YAC receiver can be in cash games, Table 6 displays the case of YAC maven Golden Tate versus his teammate Calvin Johnson, who runs much deeper routes and averages less YAC per game. Johnson averaged more points than Tate (his salary was consistently much higher, too), but it was Tate who had the higher floor that made for a superior cash game play, with significantly fewer games under 10 fantasy points than Johnson. A team’s total passing yards and passing touchdowns per game have a moderate correlation to wide receiver fantasy points per game, confirming that quarterback play indeed has a tangible impact on the fantasy production of his receivers. One way to use this information in Table 7 to your advantage is to select an elite quarterback’s cheapest starting receiver, as strong quarterback play doesn’t seem to be priced into wide receiver’s salaries. For example, last season Brandon LaFell averaged 2.19x value on FanDuel, and went over 2x in a stellar 42 percent of his games. Similarly, Emmanuel Sanders averaged 1.86x FanDuel value and reached 2x value in 50 percent of his games. This season, potential reasonably-priced beneficiaries of elite quarterback play may be LaFell again (especially since his price could fall during Tom Brady’s suspension), Marques Colston or Brandon Coleman in New Orleans, and Andre Johnson in Indianapolis. Another (more obvious) way to leverage quarterback play is stacking. In tournaments, you should nearly always have at least one wide receiver stacked with his quarterback, as having multiple lineup slots correlated increases your upside. Because tournaments require unique selections to separate lineup from the field, the best stacks often go against the grain. Stacking can also be done in cash games if each player of the stack offers good value independently. A wide receiver’s production can take a severe hit when they are playing through an injury, especially one to the leg. For example, Roddy White suffered an ankle injury in the 2013 preseason and proceeded not to top 45 receiving yards in a game though the season’s first five weeks before being shut down for a few games. Similarly, Marques Colston went through a three game lull that year that saw him catch only six passes for 44 yards before being shut down for a game with a knee injury. Going back even further, Hakeem Nicks suffered knee and ankle injuries in Week 2 of 2012 and has caught only six touchdowns in 41 games since; before the injury, he caught 25 touchdowns in 43 games. Players and teams are rarely forthcoming about the extent of an injury. As a daily fantasy owner, you need to be aware of each player’s injury history, frequently check the injury report and monitor recoveries from all injuries. If a receiver’s production has taken a hit since an injury, wait until you see on-field proof of a full recovery before taking him into consideration in cash games. Extremely windy conditions may cause a reduction in both the volume and efficiency of a team’s passing game, a point no better illustrated than by a blustery night in Foxboro in November 2013 where the normally pass-happy Broncos called 48 runs and only 36 passing plays in a loss to the Patriots. While some of the rushing volume is explained because Denver jumped out to a big lead, heavy winds deterred Peyton Manning from throwing the football as much as usual. When he did throw he was ineffective, averaging only 4.2 yards per attempt. Heavy rains can also have an impact, discouraging passing or making it more difficult. Be sure to check the weather of any game from which you are selecting receivers. Straight-line speed is similar between field turf and natural grass, but change-of-direction speed may be significantly faster on turf. T.Y. Hilton is a great example – he averages 9.99 yards per target on 239 career indoor targets, and only 7.44 yards per target on 121 career outdoor targets. Value may be found in an agile receiver playing indoors, especially if he plays his home games on natural grass. By the same token, beware when a receiver's salary increases undeservedly due to a recent, abnormally strong indoor performance when he plays most of his games outdoors. Targets have a stronger correlation to wide receiver fantasy points than any efficiency metric – emphasize volume over efficiency. A wide receiver’s upside should be thought of as touchdown potential rather than big-play potential. Wide receivers are relatively volatile compared to quarterbacks and running backs, especially in half-point-per-reception formats. Stud wide receivers generally have higher ceilings than stud running backs – get exposure to them in tournaments. 2. To qualify, a wide receiver’s season needed at least 6 games played and 8-plus fantasy points per game. 3. Calculated using the entire population of NFL wide receivers in 2013-14. 4. To qualify, a player’s season needed 6 games played, with a 10.0 fantasy point-per-game average for quarterbacks, 8.0 for running backs/wide receivers, and 6.0 for tight ends. 5. All slot snap data courtesy of PFF.